Announced at the beginning of this year, an unusual game pad Razer Project Fiona is still not available in the market, and it features are not yet revealed by manufacturer. However, the main work is completed on the device, as it fell in the laboratory of the Federal Communications Commission (FCC), according to Engadget. The large amount of information should not count, but the information obtained give some idea of the design gadget. The site FCC noted that connects to the tablet an accessory with its own built-in battery capacity of 2800 mAh. In turn, the tablet itself has a battery capacity of 5600 mAh, which is not impressive against the backdrop of a more capacious battery twice in the third-generation iPad. The Razer Project Fiona is based on the x86 platform and should be equipped with an Intel Core i7, and it is very voracious chip. 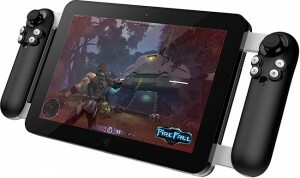 FCC records give a hint that the Razer Project Fiona game pad has removable tablet which can be used just like any traditional device of this kind, and not just as an unusual game console. In addition, the battery is connected as accessory. Unfortunately, the release date, specs, other features and release date of this unique Razer Project Fiona game pad tablet is not yet revealed so stay tuned for more updates.